EuroTube has recently partnered with SBB to advance vacuum maglev technologies with custom research facilities such as for Hyperloop. As a development partner SBB supports EuroTube in planning and building the first 3km-long research and test infrastructure for ultra-high-speed vacuum ground transportation at a candidate location in Collombey-Muraz in the Canton of Valais and provides a part of the site for the test track. EuroTube provides a research platform with the goal to pursue fundamental research as well as develop technologies for future commercial applications in the field of ultra-high-speed vacuum ground transportation. In collaboration with SBB and the Canton of Valais in depth feasibility and environmental impact studies are being carried out on the site. SBB hopes that the test track will provide important insights into the construction and operation of this potentially high-capacity transport mode and wants to gain essential findings into the application possibilities of this new transport system. “As a development partner, we will make our expertise available for the project planning and construction of the test track”, says Olivier Waeber, Project Manager – Innovation and Technology Initiatives – at SBB. As the backbone and driving force of public transport in Switzerland, SBB combines the strengths of the rail system with the potential offered by digitalization, new technologies and new modes of transport – throughout the entire travel chain. SBB is also working on sustainable service concepts, testing innovative mobility solutions and enhancing environmental measures. In partnership with EuroTube, SBB stays at the pulse of technological development in an area that may be key for the future of mobility. In this sense, EuroTube and SBB share a common vision in technological innovation to explore the benefits of vacuum maglev transportation and to pursue a sustainable mobility of the future. Wingtra supports the EuroTube team in mapping and surveying the construction site for the 3km-long test and research infrastructure in the canton of Valais with their professional WingtraOne VTOL Drone. The aim is to collect data to conduct a topographic survey of the site which is used for the modelling of the vacuum high-speed test track as well as for local feasibility studies. With its technical specifications WingtraOne is a professional VTOL (Vertical Take-off and Landing) surveying drone which was used in May 2018 to measure a stretch of land in the Rhone Valley in Valais as the chosen construction site for the vacuum high-speed test track. WingtraOne offers large coverage, high resolution as well as high quality and was therefore the perfect tool for EuroTube to efficiently map the wide area without compromising on the accuracy. 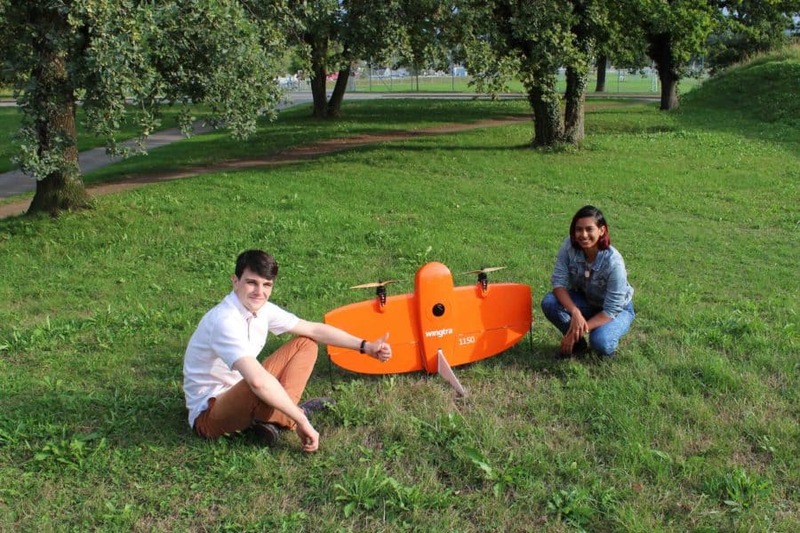 In collaboration with the Wingtra engineers, EuroTube was able to smoothly transfer the collected data into their planning software and start working with the 3D model right away. Wingtra’s expertise with its mapping and surveying strategies helped EuroTube enormously in accelerating the infrastructure planning process of their test track. 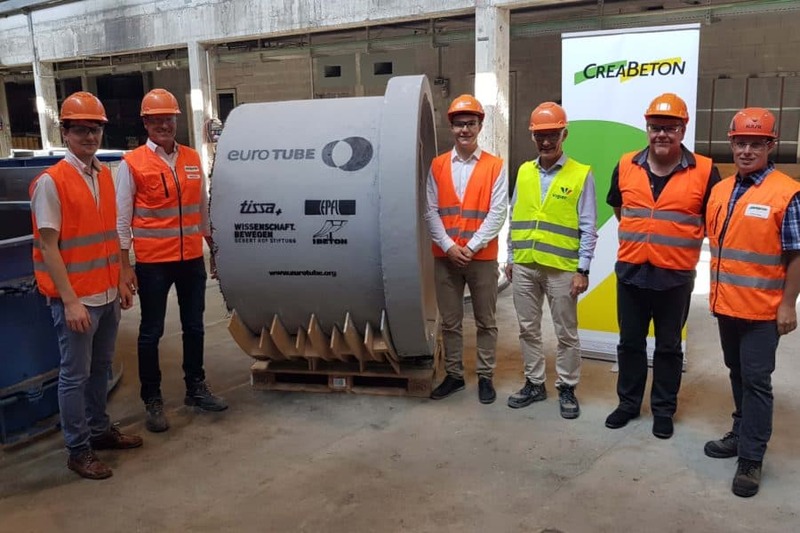 With its experience Creabeton Matériaux supports EuroTube’s leading efforts to develop its proprietary application of carbon-reinforced concrete tubes and to demonstrate its feasibility for a 3km-long tube and test track with a full-scale industrial prototype of the tube shell. With its engineering background at ETH Zürich and EPFL, EuroTube has set a strong focus on developing innovative construction materials and methodologies that reduce the construction costs for such a vacuum maglev infrastructure. In this way, EuroTube aims to provide an open research and incubation platform for startups, academia and industry for more such innovations that will enable larger-scale investments in more sustainable business plans and solve transport and infrastructure problems of the future. Creabeton Matériaux’s expertise and Vigier’s support with concrete solutions therefore matched well with EuroTube’s research and development of carbon-reinforced concrete and its unrivalled ambition to produce the world’s first vacuum transportation test infrastructure with concrete tubes. On this unique mission EuroTube and Creabeton Matériaux share a common entrepreneurial spirit and drive for technological innovation and operational excellence in the production of next-generation concrete products. With an R&D base at European research institutes, EuroTube rigs a flagship initiative with and for the European industry to stem existing, cutting-edge solutions and new breakthrough advancements in shared testing facilities for vacuum transportation via various non-profit, entrepreneurial and commercial incentives. The organisation consists of a professional engineering team with expertise in high-end engineering sectors. 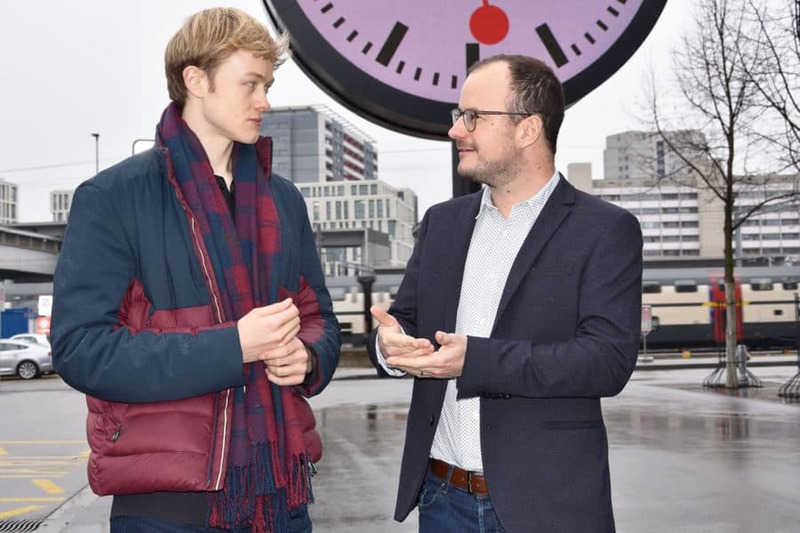 It emerges with over two years of development experience and a core team that has founded and directed Swissloop, a non-profit student engineering association at ETH Zürich. EuroTube focuses on key infrastructure technologies and promotes a community spirit to host engineering contests that play a fundamental driving force in accelerating the advent of new innovative technologies. It is a declared priority to deploy such educational and innovation-incentivising mechanisms in the public infrastructure and utilities sector. For this specific non-profit and public purpose EuroTube is not only developing novel materials but also inviting other teams and stakeholders in Europe to test their equipment on this neutral infrastructure platform and to launch their vehicles on EuroTube’s modular track design. 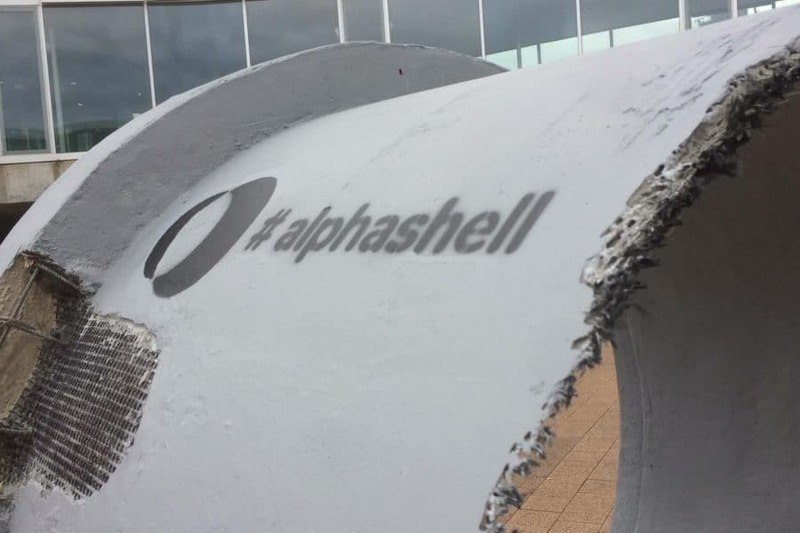 In its latest research project EuroTube has developed together with the Structural Concrete Laboratory (IBETON) of the Swiss Federal Institute of Technology in Lausanne (EPFL) an unprecedented first prototype application of textile reinforced concrete for the shell of the vacuum tube, dubbed the AlphaShell. The main advantages of textile reinforced concrete are the use of fine aggregate concrete that provides a critically low oxygen permeability and allows to create much thinner sections than are currently possible with regular concrete. Moreover, the use of a high-strength carbon mesh as reinforcement allows for great tensile and flexural strength properties. It also reduces the environmental footprint of infrastructure construction because it eliminates the need for highly pollutant clanker components. With the use of textile reinforced concrete as the main tube material, EuroTube strives to create a high-performance infrastructure while ensuring its economic efficiency. The AlphaShell was presented at the Swiss Federal Institute of Technology in Lausanne on June 14th as part of the ENAC Research Day.